The Tornado Evo made its Motorsport debut in 2001. As the name suggests it was an evolution of design from my front engine landrover based frame. 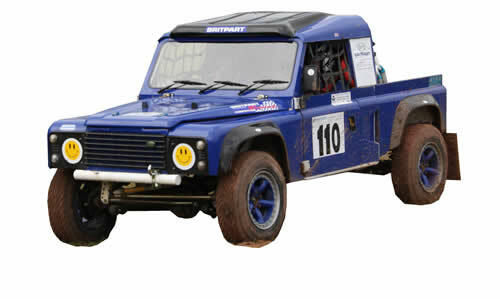 The key factor was the rear/mid engine, using 2 discovery front half chassis welded back to back . Early in 2002 came the first Evo 2. 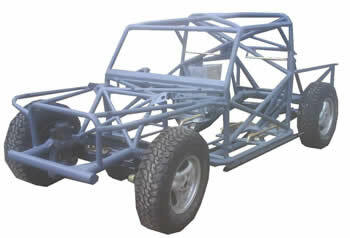 This featured a much lower roll cage, a redesigned tubular chassis (giving a gain of 3” bump travel at the same ride height) and panhard rod mounts were altered to avoid bump steer. This model stayed in continuous production until 2006 when the Evo 3 was designed and built. The Evo 3 is a much refined version of the Evo 2. Featuring GRP panels, further chassis design improvements allowing a lower main chassis rails to further improve the centre of gravity and to allow the fitment of optional under body protection. The new GRP panel work allows us to make the body 4” wider, in order to use readily available Discovery 2 axles. 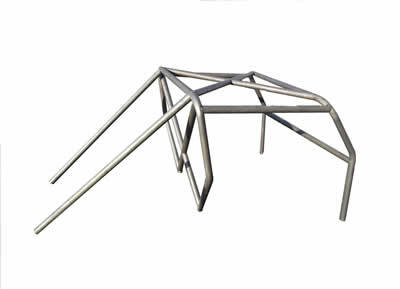 All this under standard landrover arches, giving the Evo3 the standard look, even though it is 100% jig built space frame. A further development in 2009 due to popular demand and continuous evolution saw another milestone. 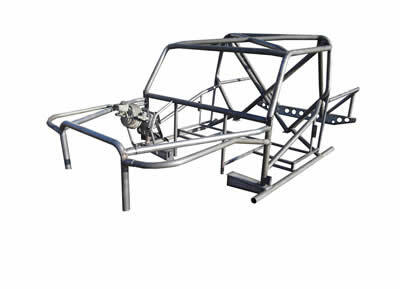 The Evo 3 roll cage pod was offered onto a discovery chassis. With some further modifications we were able to fit our lightweight GRP panels leaving the engine gearbox and radiator in the standard position. This gave the possibility of 88” and 100” models available off the shelf making the Tornado Evo an affordable DIY kit. 1. Lightweight GRP Body has been lowered on the re-profiled chassis rails to lower the centre of gravity, and gain suspension travel. 2. Vent panel removed and windscreen panel lowered for better visibility. 3. Front and back overhang greatly reduced as well as bumpers raised to increase approach and departure angles. 4. 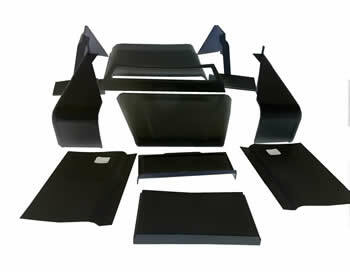 Front wings have an integral door pillar allowing the door hinges to mount on wing for a cleaner body line. 5. GRP panels available in optional colours removing expense and time involved in painting cars which are both lightweight and very scratch resistant. 6. Optional fitment of rear radiator with integral air scoop to utilize cold air drawn from above the windscreen.